LATEST UPDATE dated 18.03.2019 : Big News !! Last Date of Online Applications for UPSEE 2019 has extended. Students can apply online till 25 March, 2019. 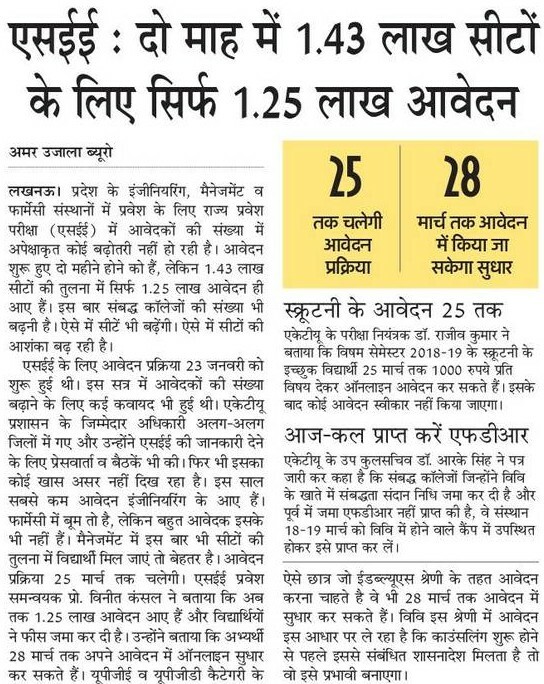 Till Date only 1.25 Lakh Students has applied for UPSEE 2019 for 1.43 Lakh seats. Read full news below..
UP State Entrance Exam (UPSEE 2019) will conduct in only Offline Mode this Year. 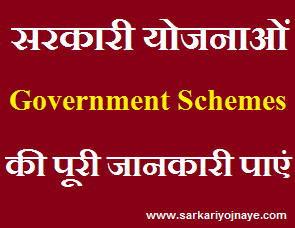 This decision is taken for Candidates of Rural Areas. Till Date 70000 Students has applied for UPSEE 2019 Entrance Test. Read full news from image below…. 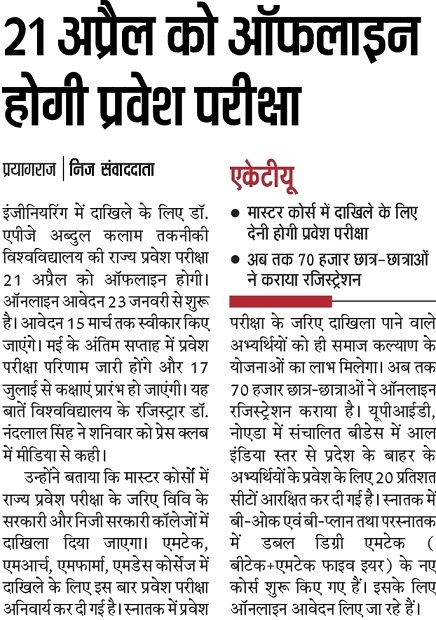 Admission Quota for Other State Candidates has increased now to 20% for UPSEE 2019. Reservation will applicable to 80% Seats only. Read full news from image below…. 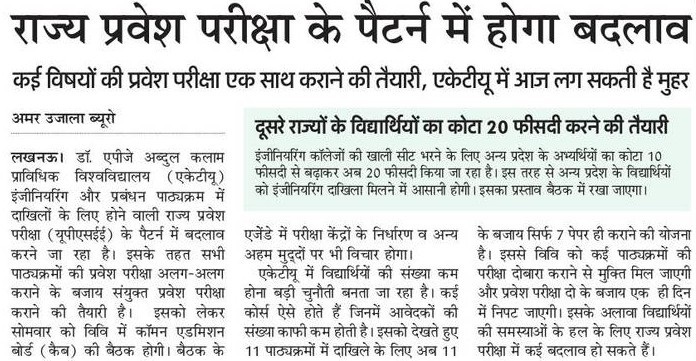 AKTU may decrease 11 papers to 07 Papers in UPSEE 2019 Exam. Thus Exam will conduct in 1 Day. UPSEE 2019 Papers can be merged. Read full news from image below…. 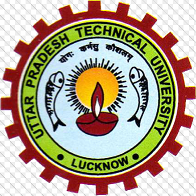 Dr. APJ Abdul Kalam Technical University eminently known as AKTU every year organizes UP State Entrance Exam (UPSEE). 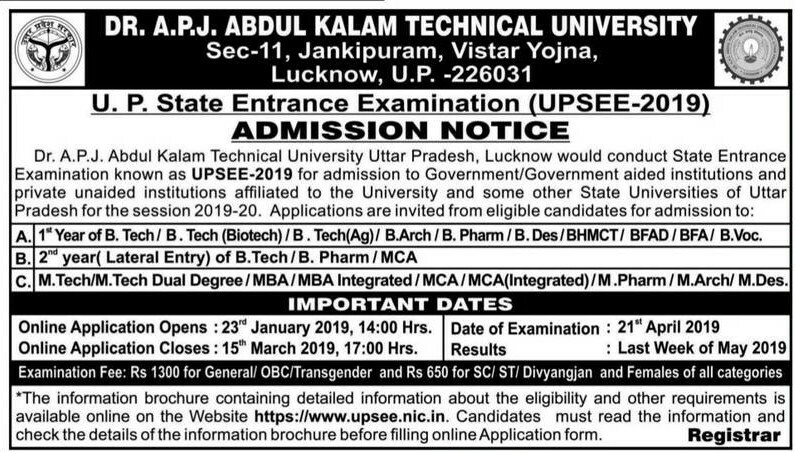 UPSEE 2019 will conduct for Admission to First Year in B.Tech/ B.Tech (Agriculture Engg. )/ B.Arch./ B.Pharm./ BHMCT/ BFAD/ BFA/ MBA/ MCA/ MAM and 2nd Year (Lateral Entry) in B. Tech/ B.Pharm./ MCA. Students can apply for various courses from One Application Form of UPSEE 2019. All Additional Options will be available in Online Application Form. There will also Entrance Exam for MBA/ MCA Integrated, B.Desh Course Aadhar Number is mandatory to fill the Online Application Form.Details of Eligibility Criteria, Fee, Course Detail is given here…. Candidates need to Download Information Brochure for Other Bachelor Degree Courses & Criteria for Post Graduate Courses. SC/ ST/ PH & Female : Rs. 550/- GST 18% Tax (Rs. 650/-). Candidates need to fill the Application Fee by mean of (Credit Card/ Debit Card/ Internet Banking) Payment Gateway of SBI OR by Submitting Challan Form in any CBS Branch of SBI. Candidates can Apply under Online Mode from the Official Website (https://upsee.nic.in). Candidates should have 10th, 12th Mark sheets/ Aadhar Card to fill Online Application Correctly. get details from the given link..